First, awaken. Then repent. Now rejoice. On Gaudete Sunday (from the Latin word for “rejoice”) we hear of joy, exultation, glory, and gladness. “Be strong,” declared the prophet Isaiah, “fear not!” Looking to the future, anticipating a time of peace and abundance, he gave several reasons for his call to joy. First, there is the “glory of the Lord, the splendor of our God.” Recognizing God’s existence and acknowledging his overwhelming beauty and power is foundational to any real joy; without this knowledge, joy is fleeting. Then there is God’s gift of salvation: “Here is your God, he comes with vindication; with divine recompense he comes to save you.” God is not just magnificent, he is magnanimous; he is not only great, he is giving. Finally, this gift of salvation is cause for everlasting joy for it means that we are meant to enter Zion, to come into his presence with thanksgiving—for all of eternity. Today’s reading from James anticipates one of the serious challenges for everyone who has awoken and repented and now waits: impatience. “Be patient, brothers and sisters,” writes James, who was addressing Christians dispersed outside of Palestine (cf. Jas. 1:1), “until the coming of the Lord.” He is emphatic on this point: “You too must be patient.” Impatience has a way of eating at our resolve, our hope, our sense of perspective. When impatience takes over, we are tempted to think we will be better off doing things our ways, in our time, and according to our wisdom. We begin to complain and our resolve wilts. Impatience let loose will eventually attack our faith and destroy our peace. St. Teresa of Avila warned of this. “Hope, O my soul, hope”, she wrote. “You know neither the day nor the hour. Watch carefully, for everything passes quickly, even though your impatience makes doubtful what is certain, and turns a very short time into a long one. Dream that the more you struggle, the more you prove the love that you bear your God, and the more you will rejoice one day with your Beloved, in a happiness and rapture that can never end” (CCC, 1821). But what of John the Baptist? Did he give into impatience? Today’s Gospel seems, at first blush, to suggest so. After all, the imprisoned prophet sent his disciples to Jesus, asking, “Are you the one who is to come?” But John, who never wavered in delivering his message or standing his ground, did this for the benefit of others. “John asks this not because he is ignorant,” explained St. Jerome, “but to guide other who are ignorant and say to them, ‘Behold, the Lamb of God, who takes away the sins of the world!’” They were attached to John, but they needed to be transformed by Christ. In sending them to Jesus, John was shaking them awake. 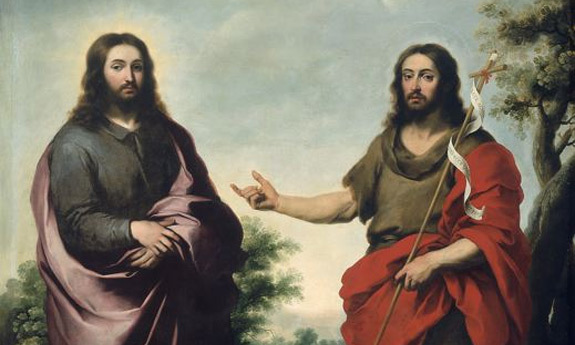 John the Baptist was a prophet—“and more than a prophet”—but he was not the Savior. He announced that the kingdom of heaven was at hand, but he was not the King. John’s greatness came from his faithful, joyful proclamation of the greatness of the Lord. Like him, we are called to rejoice in the glory, the gift, and the goodness of God.